If you need a midsize truck with a little style and a whole lot of ability, then the 2018 GMC Canyon is the ideal choice. This small pickup truck is one of the most popular models on the market today, and our team will show you why it will make a lasting impression. Easily manage your cargo with this trucks EZ-lift system and lower tailgate. Add a spray-on bed liner to your midsize that will not only protect the bed of your truck but add a little style to the exterior. This pickup features chrome grille surround along with chrome mirror caps and door handles. 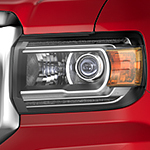 Attention to detail is GMC's motto, and the exterior of this pickup is no exception. If you want the best in GMC Midsize Canyon pickups, then come see us today at Adams Chevrolet Buick GMC. Conveniently located in Wetaskiwin, we offer an extensive selection of trucks that suits your need.